Maintain sustained lifting action, frequent starts and stops, and other demanding production applications with these air-powered hoists. They are useful where an electric hoist may pose a hazard, such as flammable, dusty, or dirty environments, or where electric power isn't available. Operation requirements include a pneumatic system that can keep up with compressed air supply demands and a filter, regulator, and lubricator in the supply line. Conduct standard lifting and positioning tasks in machine shops, loading docks, and maintenance facilities with these general purpose air-powered hoists. Manually adjust the lifting speed for maximum control over your load. 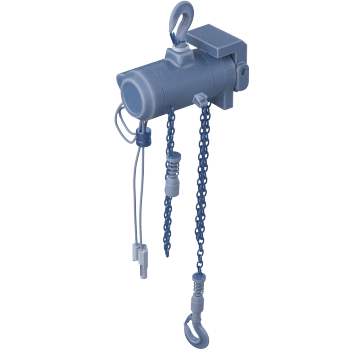 Hoists have a brake system to keep the load from moving while at rest, a lightweight aluminum housing, a pendant throttle control for 1-handed operation, upper and lower limit switches, and safety swivel load and suspension hooks. These hoists meet specification ASME/ANSI B30.16. With a small, lightweight aluminum housing, these air-powered hoists easily install wherever they're needed. They have a spring-loaded vane motor and manually adjustable lift speed settings, which provide precise control and efficiency for fast-paced assembly line and workstation applications. 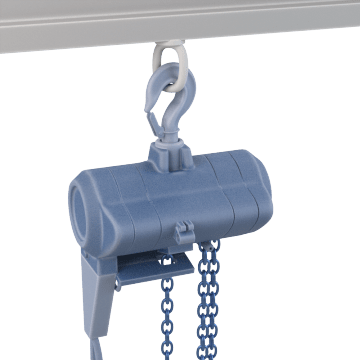 Hoists have a secure disc-braking system and a control pendant or cord for maximum control over the load. 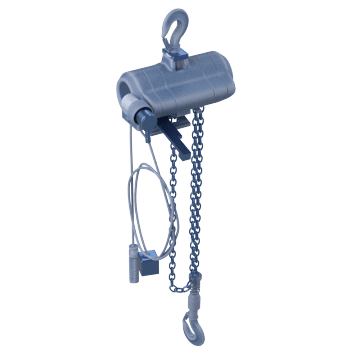 They emit low noise levels, and include a durable and corrosion-resistant load chain and safety load and suspension hooks. These hoists meet specification ANSI/ASME B30.17. Use these heavy duty hoists in demanding environments such as in foundries, construction sites, and heavy assembly applications. 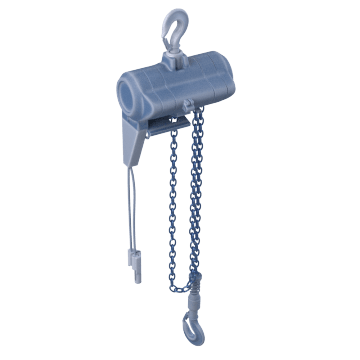 They have a strong, durable, case-hardened load chain for lifting heavy loads. A self-adjusting enclosed brake provides load control, while the spring-loaded vane motor and pilot air control provide precise positioning at variable speeds. For added safety, hoists have a load-limiting device prevents lifting items beyond the hoist's rated capacity. These hoists meet specification ANSI/ASME B30.17.